Greetings, stitchers! Are you looking for a child's gift that will be treasured for generations? 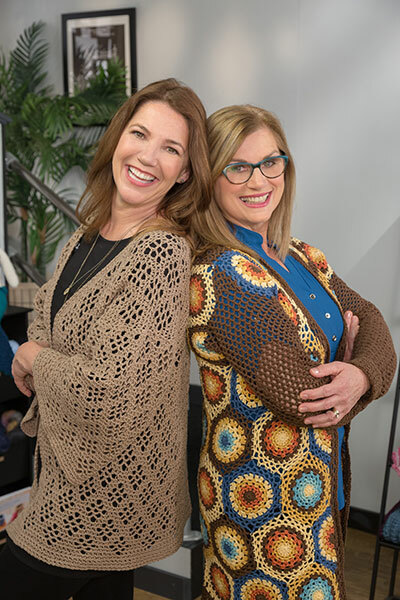 Annie's experts are ready to show you how to make adorable blankets on Knit and Crochet Now!, episode seven of season nine. I'm Mary Forte, your Knit and Crochet Now! update editor, and I'm excited to tell you about the projects you will find in episode seven, titled "Teddy Bear Blankets." This episode combines two of my favorite types of projects: children's gifts and hoods. 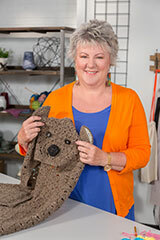 Annie's experts Rohn Strong and Jenny King show us how to make a child's blanket extra special by adding hoods and adorable bear faces. And Lena Skvagerson demonstrates how post stitches create lovely crochet cables in the Square of the Week segment. 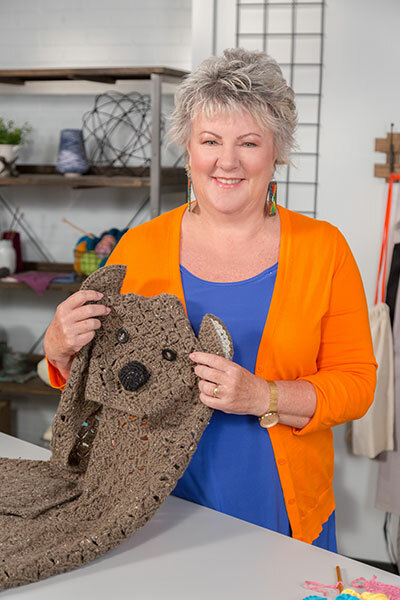 Host/producer Lena Skvagerson, host Connie Ellison, expert Rohn Strong and expert Jenny King will help you expand your knit and crochet skills. There's so much to love about children's projects. Because they are small, they are relatively quick and make great take-along projects. And what's more likely to become a family heirloom than a handcrafted item? Think about how fun it would be to pair a teddy bear blanket with a huggable teddy bear. 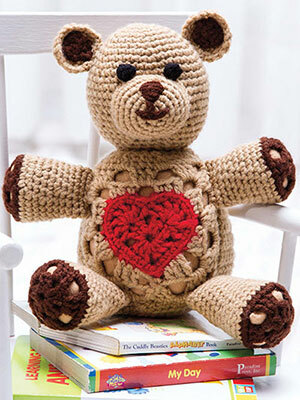 The Love You Teddy crochet pattern is just one of the many projects you can find on Annie's Creative Studio. Don't miss the video in which expert Lee Sartori guides you through the steps. And speaking of crochet for kids, how about crochet by kids? Eleven-year-old Jonah Larson from La Crosse, Wis., is a crochet prodigy. Search for "Jonah's Hands" on the Web and you will find him with his flying fingers and giant smile. I especially love his "Pickler" Hat Tutorial. And there's much more to the story. Jonah was adopted from an orphanage in Ethiopia, and now he turns his crochet talents to improving life for others. He sells his creations on Instagram and donates to Roots Ethiopia, a nonprofit that works on improving schools and creating jobs. Jonah will be publishing a book about his life this summer: Hello, Crochet Friends! Making Art, Being Mindful, Giving Back: Do What Makes You Happy. 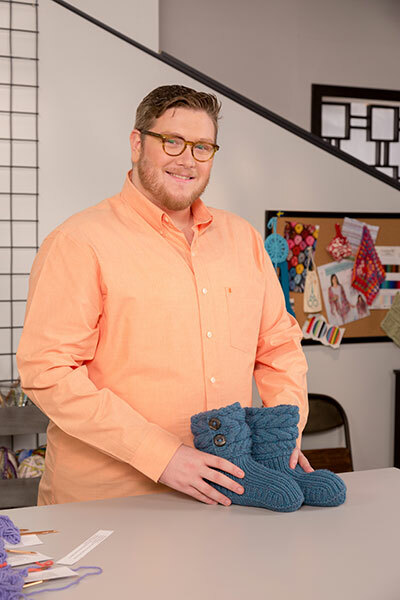 And wonderful news: Jonah will be a special guest for two episodes of season 10 of Knit and Crochet Now! I can't wait to read his book and see him on the show! Where Can You View Episode Seven of Season Nine? • Most PBS stations show Knit and Crochet Now! Find Knit and Crochet Now! on your local PBS station's TV schedule here. Set that DVR! • Create TV offers Knit and Crochet Now! episodes along with lots of other exciting how-to programming. • The Knit and Crochet Now! 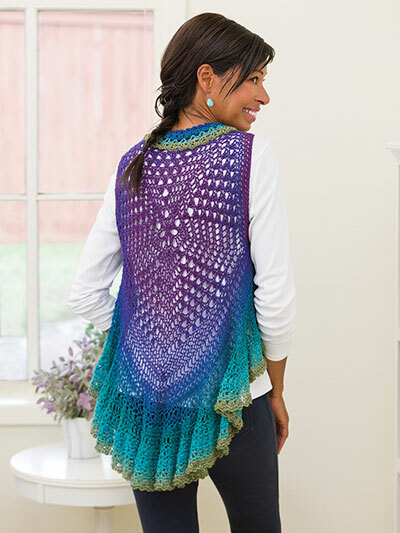 website has all nine seasons, and you can find free downloads of all the patterns featured in each episode. • Annie's Creative Studio, Annie's premium creative-education network, offers all nine seasons of Knit and Crochet Now! 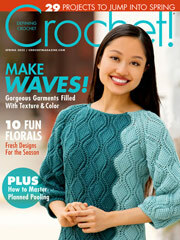 along with videos and patterns for crocheting, knitting, quilting, sewing and other crafts. Annie's Creative Studio's extensive library includes garments, totes, stuffed animals and so much more. You can get tips for updating your home or even for cleaning your sewing machine! Check out the free trial membership to explore your favorite crafts and learn about new ones. Are you ready to hear Rohn's, Lena's and Jenny's great tips and techniques for teddy bear blankets and crocheted cables? Click on the Reviews tab at the top of this page!